Creamy, sweet and as easy and delicious as it is pretty for breakfast or a snack. Combine the ingredients for the honey vanilla layer in the jar of your blender and blend to desired texture. Divide between 2 glasses and place in the freezer while making the blueberry layer to slightly harden the top. Using the same blender jar (no need to wash it out), add the ingredients for the blueberry layer and blend to desired texture. 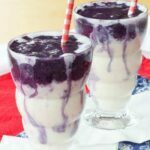 Gently pour the blueberry layer on top of the honey vanilla layer and swirl with a straw, spoon, or skewer by pressing it through the blueberry layer and down the sides of the glass.